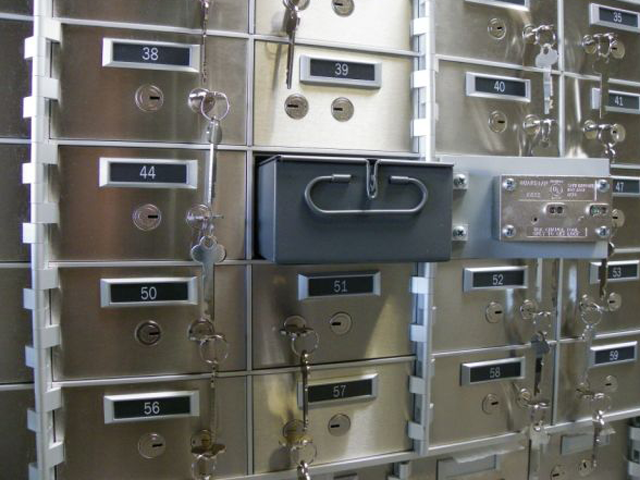 Today’s new standard in safe deposit boxes has been developed by INKAS® Safe Manufacturing – the innovative company specializing in institutional security since 1999. Through the use of rugged stainless steel, steel, and aluminum construction, with virtually maintenance free finishes, INKAS® LDB and SDB Series safe deposit boxes offer attractive, low cost modular construction, and minimal upkeep. Construction – INKAS® LDB and SDB Series of safe deposit boxes combines ½” solid alloy doors faced with stainless steel with cabinets of pow-der coated rust-resistant steel. For high security, the doors are designed with a heavy flange which interlocks with the door jamb. The modular cabinets can be stacked in sections, and bolted together through pre-drilled holes in the frame, for an easy in-stallation. The LDB and SDB Series can be installed against the vault wall, utilizing every inch of valuable wall space. Locks – As standard, doors are fitted with a double nose, key changeable lock both guard and customer side, and listed by Underwriters’ Laboratories, Northbrook, IL, USA. Locks are firmly attached to the door at four points to aid in prevention of punch attacks. Number Plates – Glare-resistant matte finish number plates are recessed into a special frame which compliments the stainless steel and ano-dized aluminum finishes. Plates may be easily interchanged at a later date if the numbering sequence is changed. Key Tags – Attractive imprinted plastic tags with key ring are available at an additional cost. Standard procedure provides two customer keys in a sealed, numbered envelope. Bases – Constructed of heavy duty tubular steel and finished in stainless steel to match the boxes. Standard bases are 3 1/2” high and equipped with levelling legs. Bond Boxes – Metal bond boxes are furnished in all sizes. Boxes are construct-ed from sheet metal and finished in a grey powder coated enam-el finish. Pull-out Shelf – An optional pull-out shelf for the convenience in handling customers’ bond boxes is available. The shelf is framed in heavy gauge steel, and finished in stainless steel to match the boxes. A spacer section (dummy) the same height as the shelf unit is available to be used alternatively on verti-cal sections to maintain equal stacking dimensions.